ALT reaches 300 Certified Members! We are very pleased to announce that the 300th successful CMALT candidate has recently been awarded the accreditation. "Completing my CMALT portfolio gave me the opportunity to reflect critically on the various projects and initiatives I have been involved in recently and in my career working in the HE sector and using technology. I undertook this with a group - the Bloomsbury Learning Environment cohort - and the monthly meetings kept me on track, as did the guidance and questioning from the group co-ordinator and the discussions of the group. It means a great deal to me to have my efforts be validated and to receive a recognised accreditation. As the 300th certified member of ALT I am very pleased to join this special group of practitioners." CMALT candidates build a portfolio which allows them to reflect on and to demonstrate their experience, skills and achievements as learning technologists. Commenting on this milestone and on the growing importance of professional recognition for learning technology skills and experience, Maren Deepwell, chief executive of ALT, says: "We are delighted to be celebrating this milestone. Over the past 2 years we have seen a sharp increase in the number of cohorts from both Higher and Further Education who are undertaking CMALT with the support of their institution. CMALT helps recognise skills like communication, and approaches to using learning technology effectively, that remain relevant even when technology changes, and that is one of the key strengths of the scheme." CMALT is recognised across sectors as a valuable professional development tool and a hallmark of good practice in the field of learning technology. 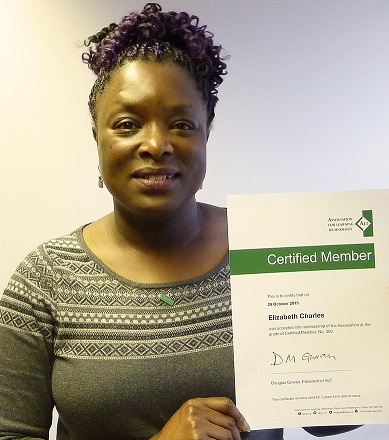 You can find out more about the Certified Membership scheme here. ALT also offers promotional initiatives to encourage individuals and groups to participate. This year's ALT Online Winter Conference will include a session on 'Showcasing different approached to building a CMALT portfolio'.